In addition to being the epicenter for cocktails and bartending each year, Tales of the Cocktail has become a major spot for spirit companies to launch new products and get real time, on the ground feedback from the people who they hope will buy and serve it. This year at Tales, there were a great number of new products vying for attention. We picked the most noteworthy, the ones to keep an eye on as they find wide, national release. 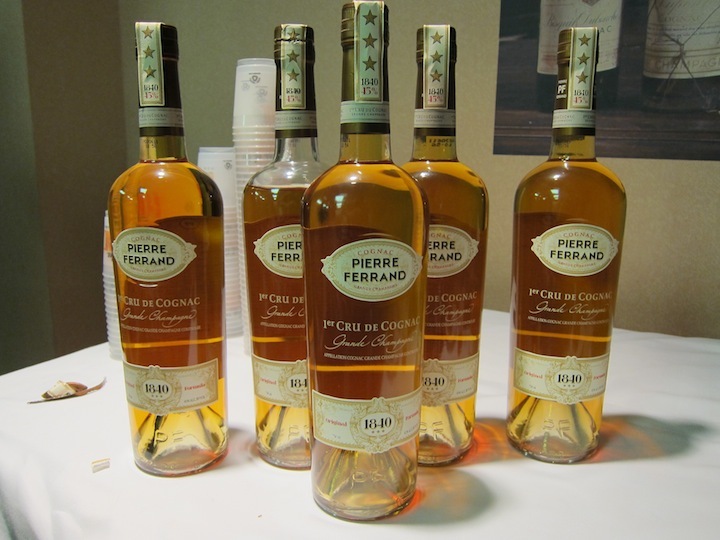 Pierre Ferrand 1840 Original Formula 1st Cru De Cognac ($45, 90 Proof) – Pierre Ferrand has made a bold move in the cognac space, releasing a spirit which is almost exclusively cocktail focused. Developed by Pierre Ferrand owner Alexandre Gabriel in conjunction with cocktail historian David Wondrich, this cognac was patterned after an exceptionally well preserved bottle of cognac from 1840. The nose on the 1840 is very floral, slightly grappa-like, and very dry. The entry is also very floral with nice grape notes. It’s slightly sweet with an almost powdered sugar note to it. There’s some strong heat on the mid-palate with a very dry finish. The 1840 Cognac isn’t really designed to be a sipping cognac and at 90 proof it does exceptional in cocktails Presented in the classic Chanticleer Cocktail (Pierre Ferrand 1840 Original Formula, superfine sugar, water, Peychaud’s bitters, and absinthe), the 1840 really shows what its capable of in a cocktail. The 1840 Original Formula Cognac may be the most significant mixing cognac released yet. Don Julio 70 Anejo Claro ($70, 80 proof) – Don Julio didn’t just launch a new product at Tales of the Cocktail, they announced an entire new category. Don Julio 70 is an “anejo claro” or a clear anejo. Through a new patented process (which involves carbon filtering), Master Distiller Enrique de Colsa selectively strips away some of the wood elements from his anejo and transforms it back into a ‘clear spirit’. “The wonderful flavors you get in our blanco are there in the anejo, but you don’t always notice them because of the flavors of the wood,” explains de Colsa. By stripping some of that away, he’s created a spirit that both captures the essence of a blanco tequila as well as the spice of an anejo. 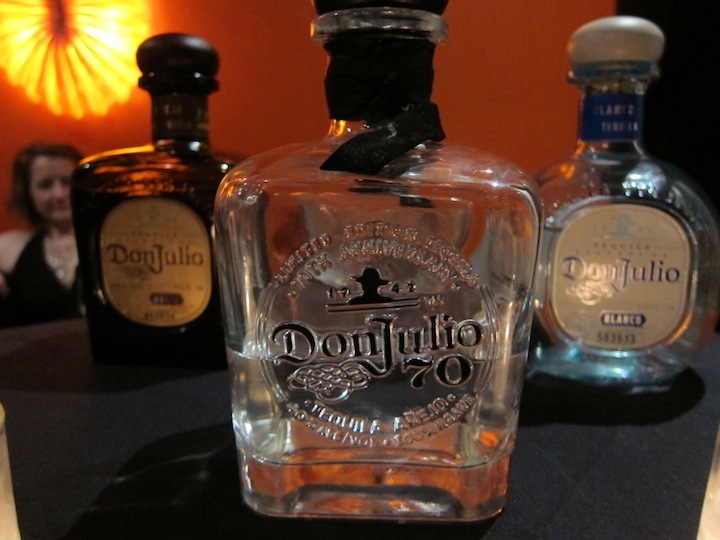 The Don Julio 70 has a slightly sharp and spicy nose with pepper, fresh agave, and light wood undertones. The entry is spicy with a nice mouthfeel and isn’t overly sweet. The mid palate has a fairly strong pepper kick with subtle vanilla and wood underneath. The finish is sharp with some heat on the palate. Don Julio 70 will be released in October in limited quantities. It seems fairly clearly aimed at being a Patron killer and gives the premium tequila drinker another option for when they’re looking for a spicy tequila. Caorunn Small Batch Scottish Gin ($39.99, 83.6 Proof) – While Hendricks has made its name as an iconoclastic Scottish gin, Caorunn takes a much different approach. Caorunn takes the traditional botanical mix (angelica root, coriander seed, orange peel, lemon peel, cassia bark, and juniper berry) and adds five distinctly Scottish and locally sourced botanicals (coul blush apple, bog myrtle, rowan berry, heather, and dandelion). The gin has a very soft, bright, and floral nose. Many of the botanicals come together as one but you can pick out the juniper and the bog myrtle (which is green and grassy in tones) in the nose. The entry is very soft, sweet, and floral that expands on the mid palate. 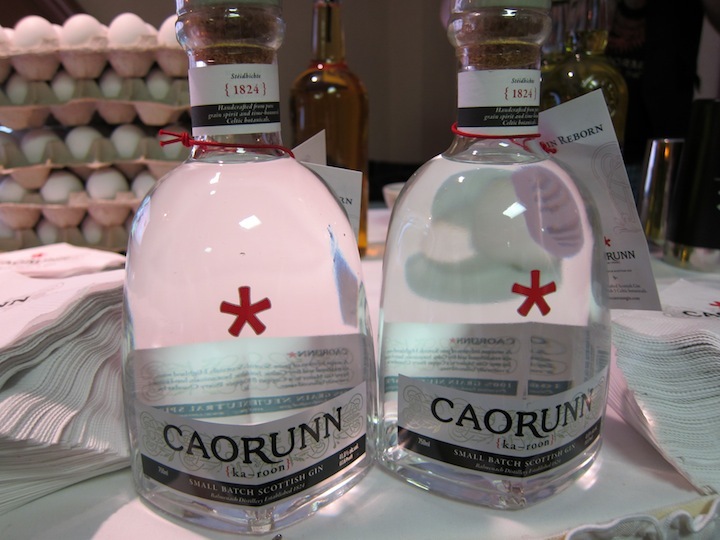 Caorunn gin is extremely flavorful, with the juniper notes definitely present but not dominating, acting like the base drum in a symphony of flavor. The finish is very long with a nice cooling. There’s also a nice fresh apple note in the middle of the finish. Caorunn Gin is packed with flavor but never feels overwhelming. It’s so soft and easy that it can easily be sipped neat – something that’s a real accomplishment for a gin. 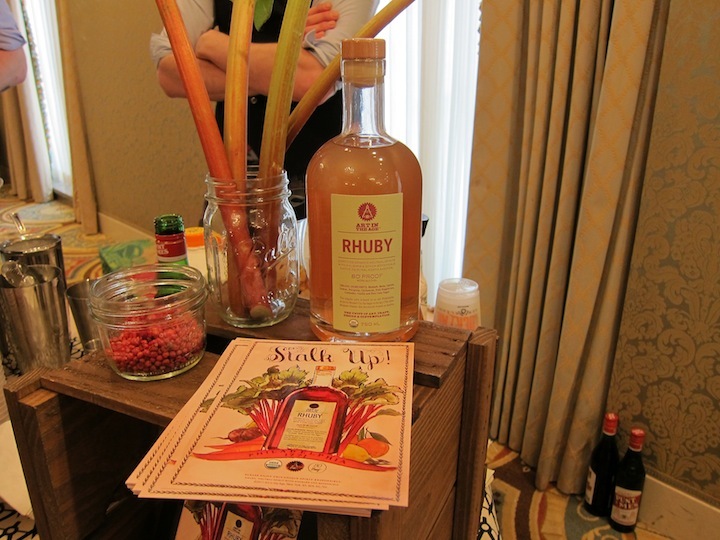 Rhuby (80 proof) comes from the folks at Art in The Age, who produce Root and Snap herbal spirits. From the nose, you’d expect Rhuby to be a departure from their other more herbal spirits, as it smells more sweet than anything else. The entry has a very strong and somewhat surprising spice to it, with pink peppercorn and cardamom hitting you right from the start. There’s some nice lemon tones that come through and, of course, there’s the rhubarb. Things get a little more sour and bitter (in a good way) in the mid palate, and then the finish is nice with just a hint of sweet. Rhuby is a unique spirit with a lot of interesting notes to play with. Of course with its rhubarb core it’ll most likely get paired with strawberry for a fruity but savory cocktail. 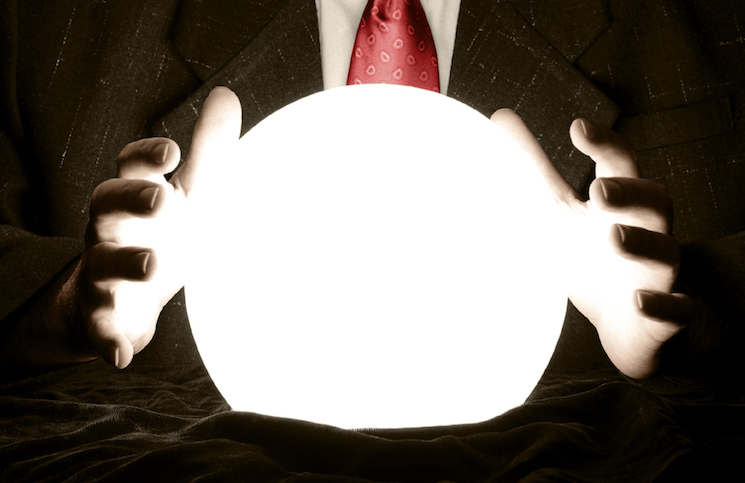 Rhuby launches in August in Pennsylvania, California in September, and then nationally in 2012. Iceland Reyka Vodka (and Brooklyn Bitters Icelandic Bitters) ($25, 80 proof) – there are so many vodkas on the market, it’s hard to get excited about a new one, but Reyka Vodka from Iceland gives us a lot to get excited about. Reyka Vodka has a wonderfully light and clean nose. The entry is nice and sweet without being too sweet, and it’s extremely smooth. 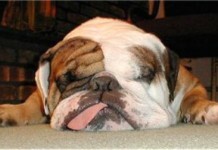 There’s some nice spice that comes through in the mid palate, but it’s never overwhelming. The finish is nice and clean and then, just after you thought it had gone, there’s a surprising bite at the very, very end of the finish. It’s an interesting experience and one that really makes this vodka stand out. Reyka Vodka is filtered through lava rock, making it wonderfully balanced and clean. We’re quite eager to get a sample bottle in our tasting group to do a formal review. Almost like Steve Jobs as he does his Apple product launches, there’s a ‘one more thing’ here, with a custom bitters released from the new Brooklyn Hemispherical Bitters (making their formal debut at Tales of the Cocktail). 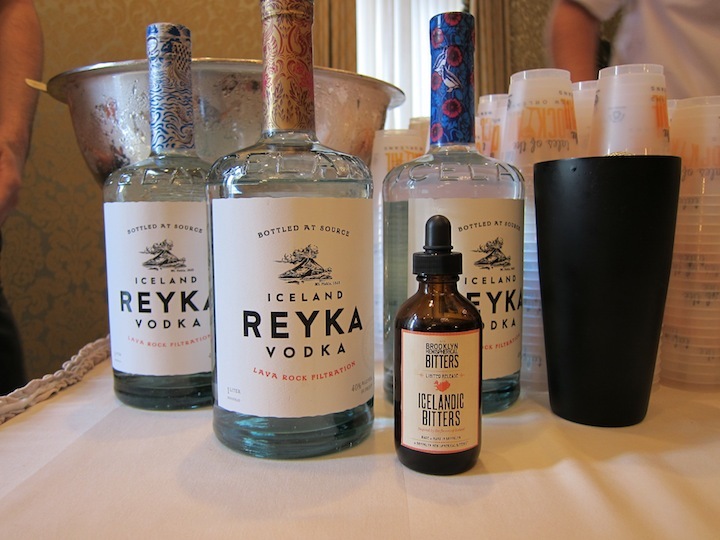 Icelandic Bitters (which isn’t on the market yet, but we hope it eventually will be) is an earthy, mossy, delicious bitter that pairs amazingly with the Reyka Vodka. It’s the kind of creative, delicious, and extremely well-crafted product that could put a new company like Brooklyn Bitters on the map. We hope to get more of their bitters in to review as well. Barolo Chinato Cocchi ($45, 33 Proof) – while there are a number of barolos on the market, there are few that are as arrestingly beautiful as the Barolo Chinato Cocchi (from the folks that bring you the equally stunning Cocchi Americano). Don’t let the price tag of this vermouth scare you away. The nose is magnificent, with great fruit, oak and spice all in perfect harmony. The entry is simply amazing with a perfect union of sweet and oak with an undertone of bitterness. There’s a very subtle layer of spice and the oak is just pitch perfect. It has a lovely deep flavor that’s simply entrancing. The finish is long with a lingering sweet bitterness that is an alluring invitation to take another sip. 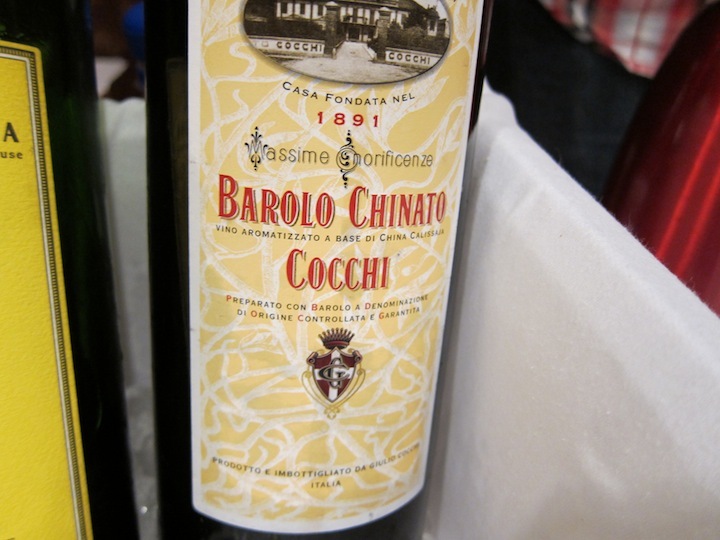 While we don’t do formal reviews of products in tasting rooms (we do all of our reviews tasted in group in our offices), Barolo Chinato Cocchi could very well be the best Barolo we’ve ever tried. Lillet Rose (34 proof) – We are huge fans of Lillet Blanc and Lillet Rouge, so the addition of another product in the Lillet line is cause to celebrate. Lillet Rose is a blend of the same Grand Cru Bordeaux wine varietals used in Lillet Blanc and Rouge with the addition of new fruit liqueurs “produced with Maison Lillet’s secret recipes.” The nose on the Lille Rose is a soft light rose wine nose. If you didn’t know it, you’d think that this was a wine and not a vermouth, but as you dig through the nose there’s a slight undercurrent of herbaciousness. The entry is soft and floral, with huge grapefruit notes that jump off the palate. The fruit transitions to dry with a slightly bitter undertone. The finish is very dry. 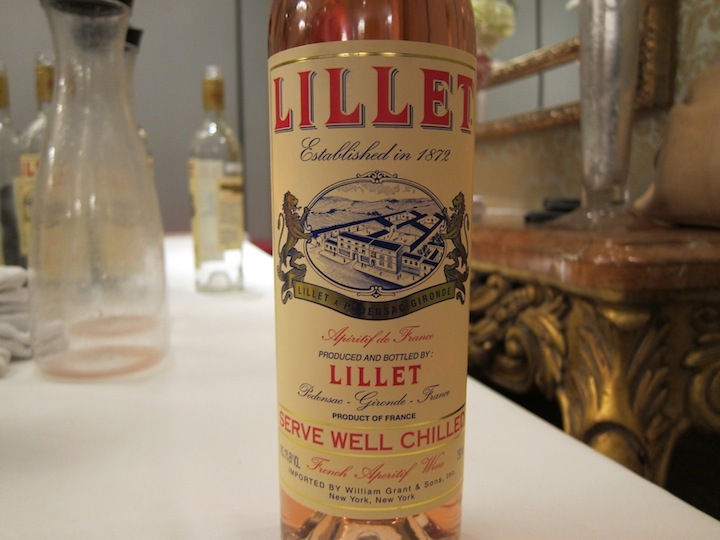 Lillet Rose is another great tool in the vermouth arsenal that should unlock a whole new class of cocktails. 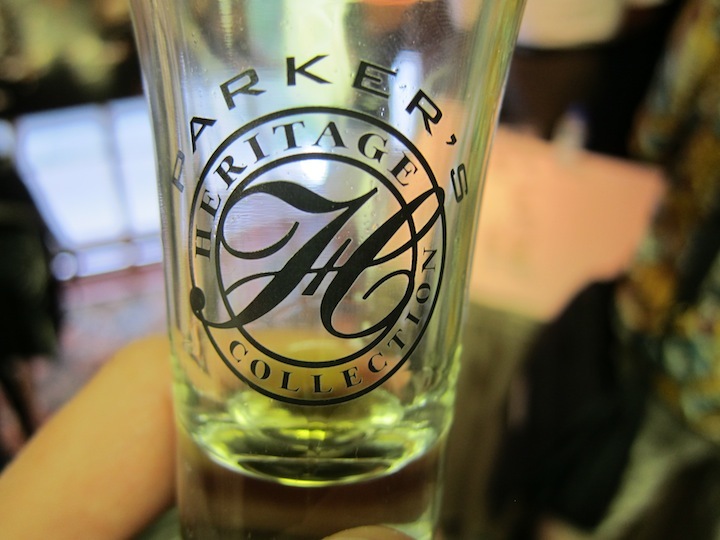 Parker’s Heritage Collection Cognac Finish Bourbon (100 proof ~$90) – The Parker Heritage Collection has always been a place for legendary distiller Parker Beam to experiment and hypothesize with bourbon. Sometimes the result is something legendary, like the Parker’s Heritage Golden Anniversary Bourbon, and sometimes it’s just plain fascinating, like the Wheated Mash Bill Release. The Parker’s Heritage Collection Cognac Finish falls more into the later category than the former as it asks the question ‘what if bourbon and cognac came together’. Parker took what is effectively 10 year old Evan Williams Single Barrel and added it to cognac barrels for 5 months. These barrels were aged in the Heaven Hill warehouse on the floor as they didn’t fit the standard Heaven Hill racks. The result is intriguing. 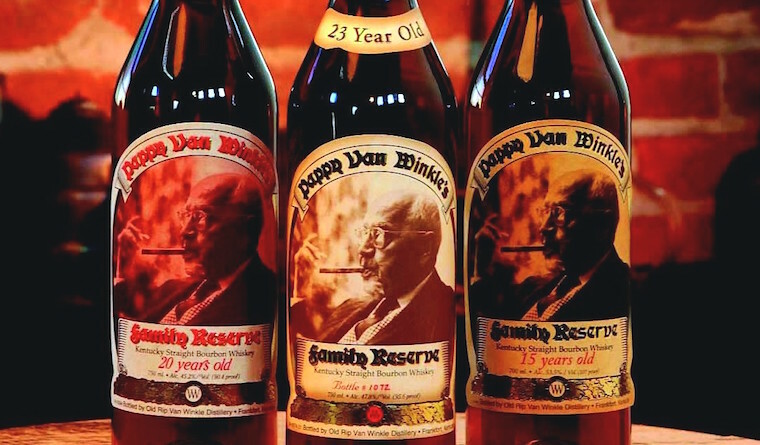 This bourbon has a sweet and slightly floral nose, with hints of vanilla. There’s a slight pasty note there as well. The entry is fairly soft and builds to a more complex mid palate with sweet and spice. The finish is long and sweet. Whiskey and cognac have come together in cocktails like the Vieux Carre well, and Parker’s Heritage Collection Cognac furthers the argument that these two flavor profiles can exist together well. Parker’s Heritage Collection Cognac Finish Bourbon will be available at the end of August 2011/ beginning of September. As with all the Parker’s Heritage releases, quantities will be very limited.